- ROYAUME-UNI – Culzean – An Iron Age round house has been identified in the grounds of Culzean Castle and Country Park in Ayrshire. A circular ditched enclosure, almost 40 metres in diameter, was spotted in aerial photographs taken of an "otherwise featureless field" at High Whitestone, just below the camping site at Culzean. Archaeologists uncovered a range of pits and postholes and an arc of curving wall foundation which suggested a timber-built round house about ten metres in diameter was once on the site. Radiocarbon dating has now dated the remains to the Iron Age, about 2,000 years ago. The site also showed signs of use throughout the medieval period - the first such evidence to be uncovered at Culzean - with the site thought to have been used in the 14th century. "Finds from the dig were very sparse and apart from a piece of burnt daub with wattle impressions in one pit there was nothing to date the site. "However, two samples of organic material were submitted to the Scottish Universities Environmental Research Centre for radiocarbon dating. "One sample was burnt hazel from the pit with the daub and the other was a piece of oak branch from one and a half metres down in the lowest clay fill of the six-metre-wide ditch that surrounds the site. "Without artefacts in the pits it was unclear just how old the site was - so it was a case of blind dating." Laboratory radiocarbon results have now revealed that the roundhouse was in use some time around 20BC to AD130. The oak branch from the ditch gave a date range of AD1290 to 1410, in the Middle Ages. It seems possible that the site was re- occupied in the 14th century. 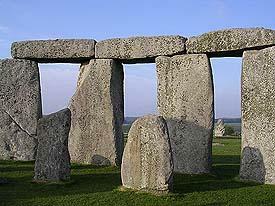 Round house designs first appeared in Britain towards the end of the Stone Age, around 2,500BC. They continued to be popular up to about AD200. They are peculiar to Britain as their use did not spread over on to the continent. Culzean Castle was the principal seat of the Kennedy family - which traces its ancestry to Robert the Bruce - from 1759. - FRANCE – Boulogne-sur-Mer - A l'occasion des travaux de restauration de la crypte sous la cathédrale Notre-Dame de Boulogne-sur-Mer, une équipe de l'INRAP a découvert des fondations gallo-romaines en bon état qui pourraient correspondre à un temple antique de la fin du 1er siècle ainsi qu'un bâtiment de la fin de l'antiquité desservant les casernements de la Classis Britannica, la flotte de Bretagne qui a permis à l'empereur Claude d'envahir la Grande Bretagne. - IRLANDE DU NORD - Dunluce - A trove of 17th century treasure has been uncovered which sheds new light on how people once shopped in the lost town of Dunluce. The settlement near the north coast castle’s walls was once destined to be the region’s great commercial centre — but fell into decline after the 1641 Rebellion. 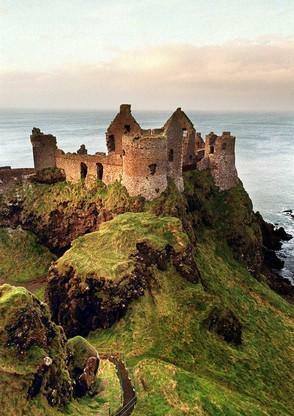 Archaeologists have spent the last few summers excavating what appeared to be a peaceful field topping the rugged cliffs of Dunluce, only to uncover a settlement that was once a hub of trade and a byword for fine living. Last summer they also discovered the remains of a medieval hall in the castle, which could well date back to the days of the Gaelic McQuillans, who were pushed out in the 1550s by the McDonalds. The nearby town was established by Randal McDonald in 1607/8 and settled exclusively by merchants from Scotland. Bone combs, dress fastenings, decorated thimbles, buckles and pieces from 17th century board games were found, plus part of a wine glass and coins from the days of Elizabeth I and Charles I. Randal McDonald had established an unofficial Plantation town at Dunluce by 1611. The foundations of a Scottish merchant’s house built in the first two decades of the 17th century were uncovered, fronting onto the very well preserved cobbled surface of a wide street. The walls of |the house still survive to waist height, with plastered walls, an internal privy and a fireplace. Numerous finds of bone and pottery provide |valuable insights into the lives of these Plantation period people while |a 16th century Polish coin, kept as a token by the merchants, provided |an interesting reminder of earlier Scottish migrations to Poland. - ROYAUME-UNI – Stonehenge - The ongoing debate surrounding the source of the famous bluestones formimg the distinctive inner circle and horseshoe of Stonehenge has taken another turn after new findings emerged from Amgueddfa Cymru – National Museum Wales. One type of bluestone, the so-called spotted dolerite, was convincingly traced to the Mynydd Preseli area of North Pembrokeshire in the 1920s, but the origins of many of the others have remained a mystery. Now geologists at the museum in Cardiff believe they have identified the source of one of the rhyolite types. A team led by Keeper of Geology Dr Richard Bevins has been using “standard petrographical techniques” and “laser ablation induction coupled mass spectrometry” on samples from Stonehenge and Pembrokeshire. Their findings, which involve the application of zircon chemistry as a new tool for “provenancing rhyolitic lithics”, point to a source for the stones in an area north of the Mynydd Preseli range, in the vicinity of Pont Saeson. The results, which are due to be published in the March 2011 edition of the Journal of Archaeological Science, may also provide some new clues about how and why the stones were transported to the Stonehenge area. The findings may also throw some new light on the belief held by some archaeologists that the stones were transported by the actions of glacier sheets during the last glaciation.